New For 2014 – Special Theatre Nights Marbella – Coming This Spring | Marbella Marbella – Adelante! 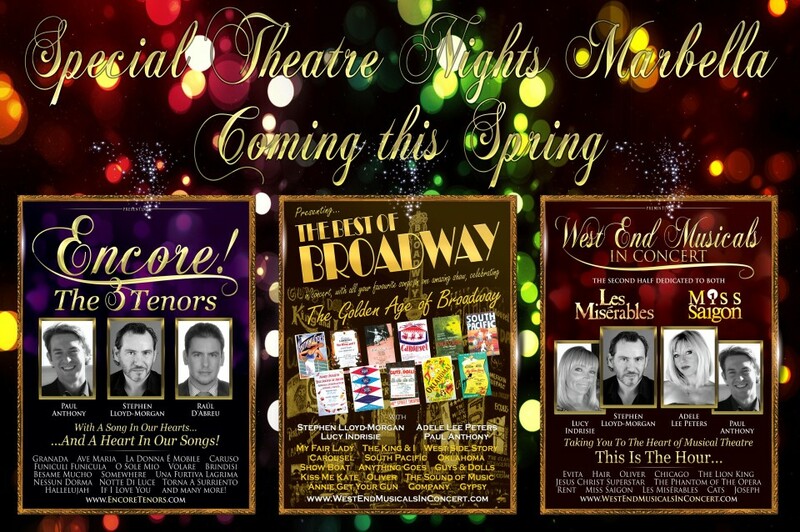 NEW SHOWS FOR 2014 – WEST END MUSICALS IN CONCERT – ENCORE! THE 3 TENORS – THE BEST OF BROADWAY – MUSIC OF THE NIGHT. In 2013 we were delighted that our shows became some of the most popular new professional productions on the Costa del Sol, showcasing a total of 50 mostly sell-out shows between April and December with an average audience of 200! It’s amazing to think that around 10,000 people were able to see the shows! Based on all the feedback we received last year, in 2014 we are focusing entirely on big-stage productions and theatre layout shows at venues with capacities of 300-600+. We want to make the shows more accessible and affordable to a wider audience and to all nationalities. This is what the audiences seem to want and we hope to deliver some spectacular shows. We aim to bring you the very best Musical Theatre and 3 Tenors’ shows available on The Costa del Sol! These shows will begin in Marbella in the Spring, with a monthly show, with 2 in each July and August. The shows will also travel to other parts of Spain and to the UK. We are delighted that the shows will continue to star Stephen Lloyd-Morgan, Adele Lee Peters, Julie-Anne Hunter, Raul D´Abreu, Paul Anthony and Lucy Indrisie as well as other special guests from Spain and the UK. Music of the Night – a special compilation of our 3 other shows and with the addition of other special guests. Although the shows don’t start until the Spring, rehearsals get under way next week, and a compilation cast album will be recorded later this month and will be released as a CD and as a download to coincide with the first show. Later this month we will release more information about the venue, dates and ticket sales, as well as information about our new media partners, associates and sponsors.